I have always been in awe of those who can sketch, draw or paint botanical subjects. The precision and craftsmanship can be breathtaking and when one considers that many of the world’s greatest botanical artists actually sketched outside in all kinds of climates and countries, we can be even more appreciative of their skill. 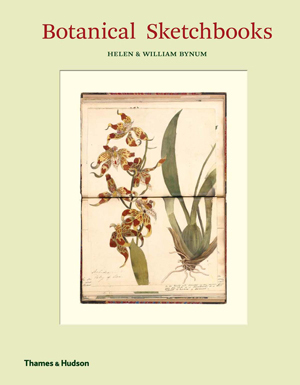 In their new book, ‘Botanical Sketchbooks‘, Helen and William Bynum have brought to a wider readership something rather special. Their book presents us with an exquisite visual compendium of botanical sketches, providing a glimpse into the first-hand adventures of over 80 artists from around the world from the 15th to the 20th century. 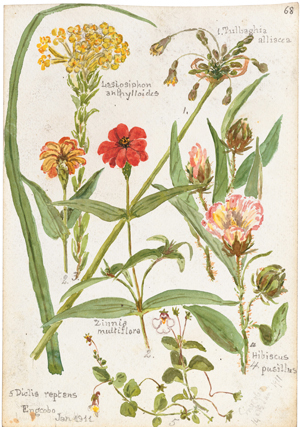 While highly finished drawings and paintings frequently feature in histories of botanic art, what makes this book even more interesting, indeed a treasure, is that the authors have collected together preparatory sketches, first impressions and creative thoughts on paper, that are rarely seen. Herein lies the value of this lovely publication as it brings these personal and vividly spontaneous records back into light. The remarkable images in the book are sourced from the unparalleled collections of the Royal Botanic Gardens, Kew, as well as a number of museums, archives and libraries. They have been carefully curated by the authors, many of them rarely, if ever, reproduced before. Here we have artists, illustrators, scientists, collectors and adventurers – professional, amateur and accidental – from around the world. We find names such as Leonardo da Vinci, Carl Linnaeus, Maria Sibylla Merian and Beatrix Potter. Sketchbooks are joined by notebooks, journals and albums and even loose pieces of paper. There are works on vellum, manuscripts, letters, herbarium sheets and marginalia – there is even a drawing on the back of an envelope! The book is divided thematically into four sections: Made on Location, Doing Science, Making Art and A Pleasing Occupation. The range of intriguing characters from many different countries and cultures is amazing. Within each section we find appropriate artists who are further subdivided into whether they can be considered adventurers, collectors, naturalists or botanists etc. This makes the book easy to follow, however, this is one publication that you can dip into at leisure to enjoy a small section or an individual artist or indeed just for the sheer joy of looking at so many wonderful sketches and notations. The authors perfectly complement the drawings and sketches included with informative facts about each artist – such as John Muir whose love of nature in his native Scotland led to his legacy in the promotion of the American National Parks. As the authors point out in the Introduction, botanical art is flourishing again and I feel sure that anyone looking at this delightful book will feel the urge to put pen or brush to paper and sketch. I found the book a pure delight, not only for the botanical sketches and the methods employed in getting to the finished drawing/painting, but also for the interesting details of the botanical artists themselves. I hadn’t appreciated, for example, that Beatrix Potter’s interest in collecting and drawing the fruiting bodies of fungi developed into a serious passion. We discover that Francis (Franz) Bauer, regarded as Kew’s first resident botanical artist, used the aid of microscopes taking the dissection of plants to a new level. This is a book filled with fascinating facts as well as exquisite drawings. Helen and William Bynum are historians of science and medicine. They have had a lifelong interest in plants and gardening and their importance in human culture. They have written and edited numerous books including Great Discoveries in Medicine and Remarkable Plants. Review copy supplied by the publishers. Image credit: All images are ©The Board of Trustees of the Royal Botanic Gardens, Kew. Banner: One of Helen Faulkner’s sketchbooks. Picture right: Marianne Harriet Mason, in watercolour with pencil touches.